South Port NZ Ltd (South Port), located at Bluff in New Zealand’s South Island, has just completed the order for a new LHM 550 mobile harbour crane. The crane will be used for highly efficient container handling for MSC, the port’s significant containerized cargo customer. The new machine is the third LHM delivered to New Zealand’s southernmost port. “South Port is the regional port operator in Southern New Zealand, and it is important to our clients that we operate with a two-crane model, giving faster turnaround time to the container vessels and allow for projected growth in this area of the business,” said chairman Rex Chapman. South Port offers a comprehensive service portfolio. A projected containerized cargo increase over the next five years in the Southern region called for additional state-of-the-art cargo handling equipment. In particular growth in agricultural products — mainly dairy industry ingredients and finished product plus stock food — meant a second crane was a must. Cargo operations manager Geoff Finnerty added,“We have worked with Liebherr since 1995, so a good partnership has evolved during that time.We know them well, and know that they will provide support when required, despite headquarters being at opposite ends of the world.” In order to maximize crane availability, Liebherr puts the focus on a well-structured global service with quick response times. 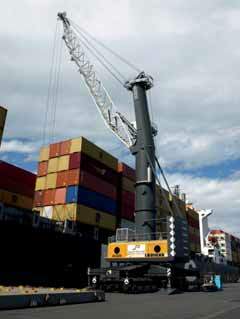 The crane comes with a twin-lift spreader and tower extension, giving a cabin height of around 29 metres. “Most of the MSC vessels enter the port light meaning they are high in the water, so the additional height of the cabin and boom pivot were essential components of the order,” Finnerty added. The crane will be operational September of this year and will work side-by-side with an LHM 400, delivered in 2010.